I’ve been running from my past for one hundred years. And I’m still just a teenager. I was selected by my teacher, Sensei, to train in The Dimension: a secret place of refuge for the ‘anomalies’ of past, present, and future earth. Here I would learn to connect to my ‘warrior within’ as Sensei calls it - to channel energy orbs, commute between realms, and even shape-shift into an alternate form. But never did I guess that my training would include taking on an anomaly student of my own: a loose cannon of a college guy named Ion. Late one evening, I invite him over to Sensei’s house for a little chat; one that will turn his life upside-down. Shoving him into the broom closet turned portal, I drag Ion into the Dimension, opening his eyes to his true homeland: a realm of anomalies. His kin. As we train to become Protectors of future Earth, battling each other as well as our own demons, I begin to realize that there’s more to Ion than I originally thought: a darkness he’s spent his life running from. And beyond that, a looming threat hidden in plain sight - something that could destroy me, him, and the future of Earth. The Blood Race is K.A. Emmons’ debut novel, and the first book in a riveting and fresh YA sci-fi/fantasy thriller series. 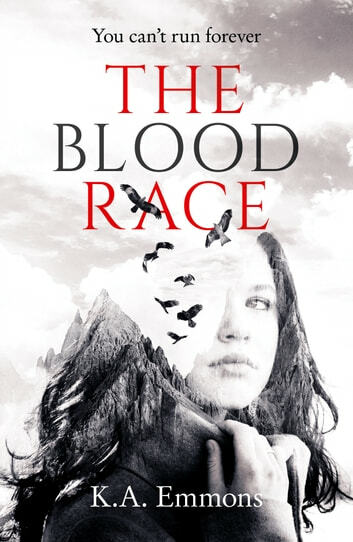 Pick up your copy of The Blood Race today! "It made me think, left me gasping from truths, and nearly in tears over the raw, emotional power of the story. From the first word, I was swept away on a wild ride that I won't be forgetting anytime soon." "The Blood Race doesn’t shy away from controversial issues. I love the diversity of races, origins, and backgrounds in the characters, as well as the book’s candor about struggles each of us face, such as temptation, deception, fear, and anger. The spiritual depth in this book is rare among young authors. I felt myself resonating with each word of wisdom spoken by Sensei, each truth that Hawk and Ion learn, each battle won. The Blood Race is a prime example of transformational fiction, entertaining but also expounding spiritual truth." Give Yourself Goosebumps: Tick Tock, You're Dead! I received a free copy of this book and opted to post a review. Heart-pounding and gut-wrenching, The Blood Race transports readers to another dimension where fantasy meets reality, and a new society has been created to prevent a battle between sliders, people with extraordinary abilities, and humanity. I found the first half of the book a bit confusing because Sensei and Hawk were both pretty cryptic about sliders, the abilities that sliders potentially have, and the sanctuary for sliders. I'm usually the type of reader who prefers "show" over "tell" but in this case, I think telling would've been more helpful to me than showing. However, everything fell into place during the second half of the book and I had a better idea of where the author was going. The setting in this book is nothing short of spectacular! K.A. Emmons has set the bar really high for other indie authors in this genre because the two worlds she created are intricate and unique. The character development was pretty good; the characters have a lot of depth and interest, but their backstories are hinted at while remaining elusive. I'm going to have to read the rest of the series before I can really say much about the character development; however, Emmons has laid the foundation for some really awesome characters to emerge later on. I enjoyed the philosophical tone of the book and the structure of the society of super-humans that Emmons created. I'm anxious to learn more about this complex society in future books and I can't wait to read the next book in the series.